LEWISTON, ME – WBRC Architects • Engineers, in association with Perkins+Will, was recognized for architectural excellence at Monday night’s 2014 AIA Maine’s Design Awards ceremony in Lewiston, receiving a Merit Award for its work at Bigelow Laboratory for Ocean Sciences. Maine-based WBRC Architects • Engineers received the award on behalf of the entire project team, which included Boston design architect Perkins+Will, contractor Consigli Construction, and owner Bigelow Laboratory for Ocean Sciences. Bigelow Laboratory for Ocean Sciences is a 60,000 SF, LEED Platinum science and education campus on the East Boothbay waterfront. The campus consists of three interconnected science and education buildings, along with a shorefront facility and dock. The $31.8-million Phase 1 campus project was made possible by a combination of state and federal grants, private financing, and private donations. A key feature of the campus is the building’s unique daylighting design. The solar orientation of the three research wings, combined with open courtyards between each wing, helps to maximize natural light in the building, creating a comfortable and energy-efficient work environment. Year-round energy recovery and other high-efficiency equipment provide an outstanding 54% energy cost savings over a conventional design. 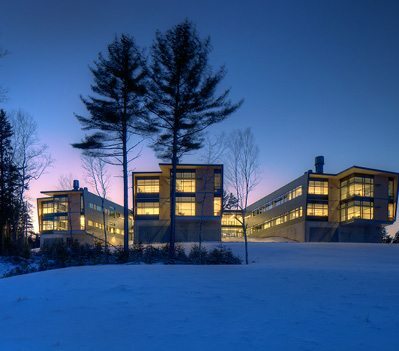 Bigelow Laboratory for Ocean Sciences campus is the first scientific research laboratory to achieve LEED Platinum status in Maine, and has won several awards in addition to the AIA Maine Merit Award since its completion. These include: 2014 Laboratory of the Year, Honorable Mention, R&D Magazine; Grand Honor Award Winner 2013, Build New England Awards Program, AGC of Massachusetts; and 2013 Sustainable Design Award and 2013 Design Excellence Citation from Boston Society of Architects. Biennially, AIA Maine sponsors a juried review of Maine architecture to recognize the important and diverse work of Maine architects. The jurors are nationally recognized peers who, after reviewing and critiquing the entries, select outstanding projects for recognition. The program has provided AIA Maine with the records of approximately 500 juried projects. This archive has become a fundamental record of the evolution of contemporary architecture in Maine. The American Institute of Architects, Maine Chapter (AIA Maine) promotes the highest standards for the design of Maine’s built environment through public advocacy, volunteerism, educational programs, outreach events, and design awards competitions. Its mission is to support architects and architecture through leadership, advocacy, fellowship, and design excellence. AIA Maine members, over 200 strong and representing every region of the state, practice in firms ranging from one to over 100 persons. For more information, visit www.aiamaine.org. Bigelow Laboratory was founded in 1974 by the late Dr. Charles S. Yentsch and his wife Dr. Clarice Yentsch. It is internationally renowned as an independent, non-profit center for global ocean research, ocean science education, and enterprise. Recognized as a leader in Maine’s emerging innovation economy, the laboratory’s research ranges from microbial oceanography to the large-scale ocean processes that drive global environmental conditions. For more information, visit www.bigelow.org. Perkins+Will brings its passion for ‘designing for science’ together with the knowledge they’ve gained planning and designing major science, education and healthcare buildings for institutional, governmental and commercial clients across the country and overseas. To each project they bring a unique understanding of their client’s objectives and an appreciation of how to utilize a structured design process to energize the client organization. This ensures the creation of high-performance buildings that enable productive and sustainable research and education communities within them. For more information please visit www.perkinswill.com.